While most of North India has whizzed past the cycle rickshaw on smoking hot Nanos and scooters, rendering its wheezing pedal pushers as outdated remembrances of the past, the ‘flying taxis’ continue to be a source of tourist amusement in the Western world. Copenhagen, in fact, revels in this mode of transport for short distances where burly, muscular Danes ferry the lazy, around cobblestone streets, for like neighbouring Amsterdam, this is a city where the inhabitants either cycle or walk, due to astronomical vehicle taxes. So you can imagine the quality of the air. Arriving from Delhi and Mumbai, we actually revel in a bout of deep breathing! After the Emirates Business Class experience, this is our second slice of true luxury. On our first evening in Denmark’s 600-year-old capital city we are greeted by the animated Anita Vystavel who leads our fleet of cycle rickshaws towards the Round Tower (Europe’s oldest functioning observatory), Parliament House, the French ambassador’s grand residence, the Royal Family’s grander abode and Copenhagen’s oldest restaurant, the Dickensian Det Lille Apotek before we step out at Torvehallerne. The finest gourmet marketplace in town, it is here that ‘sea fresh’ catch, bottled delicacies, even authentic tandoori masala, seduce buyers into imbibing and ingesting only the very best. Later, at Verandah, the first contemporary Indian restaurant in the region where we are met by co-owner and famed jazz artist Niels Lan Doky (part Vietnamese, part Dutch, married to an Indian), we absorb the warm olive green décor while sampling Hyderabadi Jalmurghi and walnut raita. The Art Deco building docked at Nyhavn also houses The Standard’s bouquet of three other restaurants – Almanak (modern Danish), Studio (fine dining) and Jazz Club (bar and bands) – and in its earlier avatars was the old customs house and the waiting area for the ferry to Sweden. It is at Nyhavn, the 17th century waterfront reinvented into a vibrant entertainment district, from where we embark on a canal cruise gliding past the architectural oomph of a country that lives by its design. The shiny, angular façade of the Royal Library nicknamed ‘black diamond’, the Opera House, churches, palaces, bell towers, the Royal Danish Playhouse and the Hans Christian Andersen-created, Edvard Eriksen-crafted Little Mermaid, now over 100 years old, all remain quite still in their splendour as we click pictures for our digital albums. Danish design icons continue to enthral at the Design Museum, formerly a hospital, which in one area showcases mid-century collections, like Arne Jacobsen’s famous egg chair and Hans J. Wegner’s Y chair. At Royal Copenhagen, the legendary porcelain manufacturer and Illums Bolighus, the high end lifestyle store, both on Stroget – the longest pedestrian shopping street in Europe – we feast our eyes on classical shapes and elegant curves that cater to the modern aesthete. From futuristic watering cans and flat-bottomed teapots to mahogany coat racks and Fatboy bean bags, this particular brand of sight-seeing makes us quite wide-eyed. And for those who want to top up Copenhagen with their favourite Carlsberg, the brewery, the fourth largest group in the world, established in 1847 by J.C. Jacobsen, is but a short drive away. On warm, summer weekends, concerts and plays take place in the old Tap buildings. Enjoy a glass of the golden brew at the courtyard bar and watch a muscled Jutland dray horse being washed down and groomed to a chestnut glow before it noisily emerges from the stable for its daily stroll. Originally bred for agriculture, the breed which can be traced to the Middle Ages, is seen more often today at horse shows and demonstrations pulling beer wagons for the company. But at the end of a swift sojourn in Viking country, especially after we pose against a great storyteller’s bronze likeness and curl up in the comforting environs of the quaint Kong Arthur hotel, Copenhagen, to some of us, is the archetypical, mysterious land which gave birth to such legendary characters as the icy Snow Queen and the deliciously nimble Thumbelina. 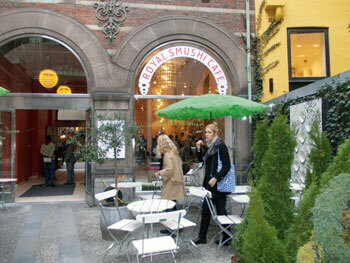 ROYAL SMUSHI CAFÉ (next to Royal Copenhagen) – For Danish classics like red berry pudding and bite-sized open sandwiches (smushis); fine selections of teas and coffee; funky designer chic by Bang and Olufsen, Fritz Hansen and Holmegaard; lots of buzz. NIMB BRASSERIE (in Tivoli Gardens)- For the sugar-salted salmon, Beauf Bourguignon, lemon-drenched oysters, white chocolate parfait; window seat view of the throbbing 19th century amusement park; housed in the luxe Nimb Hotel designed in 1909 as an Arabian fantasy; magical wedding venue. MARCHAL (in Hotel d’ Angleterre) – For the juniper smoked cod with thyme cream, plums and buttermilk snow, marshmallows dunked in dark chocolate on marzipan and an amazing wine list; 18th century burnished locale for the well shod and impeccably styled. NYHAVNS FAERGEKRO (Nyhavn 5) – For the authentic herring buffet or a Danish smorgasbord of fish cakes, shrimps, pates, roasts, farmer’s bread and apple cake; traditional tavern-like interior; popular local hangout, overlooking the canal.